Don’t believe dreams come true? 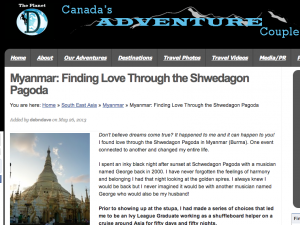 It happened to me and it can happen to you!I found love through the Shwedagon Pagoda in Myanmar (Burma). One event connected to another and changed my entire life. I spent an inky black night after sunset at Schwedagon Pagoda with a musician named George back in 2000. I have never forgotten the feelings of harmony and belonging I had that night looking at the golden spires. I always knew I would be back but I never imagined it would be with another musician named George who would also be my husband! Prior to showing up at the stupa, I had made a series of choices that led me to be an Ivy League Graduate working as a shuffleboard helper on a cruise around Asia for fifty days and fifty nights. Dropping out of a top five medical school allowed me the time to learn to SCUBA dive. Desiring to dive but earning the pittance of a schoolteacher’s salary encouraged me to leap into a position at Club Med as a GO and trapeze artist. My next hop onto a series of cruise ships meant I sailed on the Yellow Sea into Yangon in 2000. After seven years of pulling into different ports, the most remarkable sunset was at Schwedagon Pagoda. I will never forget that night.